Many great moments spring to mind when one thinks of McLaren. There are the Grand Prix victories and Formula One titles of James Hunt, Lewis Hamilton and the late Ayrton Senna. The McLaren F1 long held the record for the fastest production car. And McLaren have been pioneers in such fields as aerodynamics, lightweight materials and electric power. McLaren is no longer just a motor-racing team, however. Over the past few years they have taken the technologies and skills developed in Formula 1 and begun to look at how these could bring about improvements in fields as diverse as healthcare, energy and manufacturing. Last week, I visited McLaren with a group of Permanent Secretary colleagues to see how their innovative work could contribute to our ambitions to design the most modern and efficient civil service anywhere. The Technology Centre in Woking, designed by Lord Foster, is an architectural masterpiece. The foyer is lined with championship winning cars. No two models were the same, with each modified to be more responsive, to turn quicker, to go faster. For me, the highlight of our visit was seeing the control room used by McLaren’s engineers to direct the team’s strategy during races. During every race, it receives real-time performance information from 400 different sensors on the car. The volume and complexity of this data is staggering – the equivalent of 6,000 phone books. Using cutting-edge analytics software, this data is visualised for the engineers in a series of graphs and charts that allow them to make split-second decisions on what the driver should do next. This approach is exactly how McLaren has helped other organisations to gain a competitive edge – in everything from financial services to factory processes and the handling of clinical trials. It always starts with gathering the right data. McLaren will often support businesses to put the correct ‘sensors’ in place so they can gather the information they need. They then advise on ordering and translating this data into a format that can be understood and analysed. This process helps reveal the true causes of a problem, and ultimately allows the optimal solution to be found. There is much the Civil Service can learn from such an approach. It is crucial that the decisions we make are underpinned by solid evidence and analysis, both in formulating and delivering policy. This has long been a Civil Service priority and we have made significant progress. The Data Science Accelerator Programme is enabling analysts from government departments and agencies to use new techniques and technologies in their work. What Works centres are improving the collection and use of evidence in vital areas – such as crime prevention, local economic growth and social care – which receive more than £200 billion of public spending. New kinds of data visualisation are transforming decision-making. We are working to ensure that when widespread flooding occurs, ministers attending emergency COBR meetings can see real-time interactive information projected onto large screens, rather than relying on photocopied maps. We still have a way to go until this becomes the default approach across the whole of government, but I returned from McLaren determined that we continue to improve our capability in this important sphere. 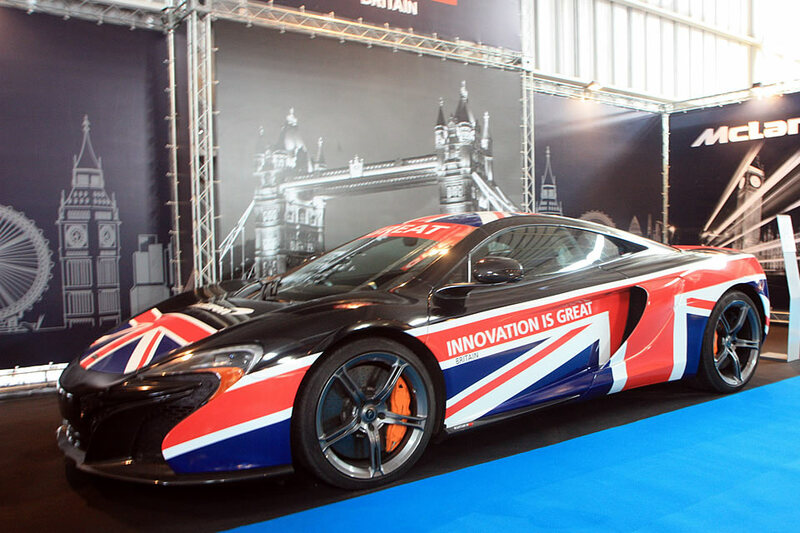 In the meantime, McLaren represents British innovation at its best. Read more about what they do here. I believe this is the kind of innovative cutting edge approach that is needed and it is a great thing that the civil service is trying to learn from the best. One question does spring to mind. Do McLaren use the PMR system when appraising their staff? If not (and as far as I am aware most if not all top performing organisations in the private sector do not use it) maybe we can learn something from that side of the business as well. An excellent point, David. But I suspect that is one "innovative approach" of the much lauded private sector that the Civil Service will choose to ignore. I don't believe that McLaren were ever 'pioneers' in aerodynamics. What is the basis for the statement that they are? In motorsport the 'pioneers' in aerodynamics were Lotus and arguably Brabham, and Williams in that order. What nonsense - yet another example of the self-defeating belief that the profit-generating techniques of the private sector can be transplanted into public sector activity. The scandals of the last few years - for example, mis-selling of banks products and services, false accounting by large corporations in the supermarket sector, etc - show that what is needed is for the old ethos of the public sector, and the motive of serving the public good, should be imported into the private sector. Seem like a system viewing an individual as a individual or a individual team as an individual team. There is no comparing apples to either oranges, pears or bananas. The answer is surely in the prof's question, firstly by using cutting-edge technology! but this would be like asking ministers to cut off their right arms, and as the last paragraph implies...'We still have a way to go until this becomes the default approach across the whole of government'...how many times year on year off do we hear this; what the prof basically means is that the concept is a non-starter for the remainder of the civil service. A subject for continual, endless debate only! In a relatively long service my experience is that it will never happen I'm afraid. A second point would indeed be to learn their motivation techniques, what drives people to want to be successful and so on.....and I rather thInk that it will be far removed from the inadequacy and suffocation of PMR which stifles initiative and lacks creativity. Clearly McLaren are a modern, forward thinking organisation free and far removed from historical servitude. McLaren also are not directly responsible for the livelihoods of employees on the same scale as the Civil Service, nor are they saddled with the same legacies and obligations. Yes, by all means take a look at what McLaren's get up to, but beware of scientists with simplistic Frankensteinian visions over how to translate data capture lessons into our world. First, we need the culture and the technology investment to be able to do that. And whilst I applaud Paul Bristow's comment about the public sector ethos, and the general idea of being in business to make a difference, and not just to maximise financial gain, I'm not sure diseases afflicting parts of the (corporate) private sector have not already made their way into our world. You can have all the data gathering, analysis and formulations you want. But if it goes against the prevailng poliitical ideology then it'll get squewed to fit, or just ignored completely. Nice day out for the lads then... Quite surprised that any of the SCS actually new anything about technology other than where the on/off switch is on their computers. Our Department recently decided to 'upgrade' one of our systems and months down the line are still trying to make this system work by looking for work-arounds and fixes - it doesn't work. That is what you get when you buy off of the shelf instead of investing in a bespoke system that does what you want it to do. Nice Article but as a F1 fan, McLaren's performance this year have been dire. Maybe they have tried to change things this too much too quickly. Which sounds very familiar in the Civil Service today. New technology is great but not much good if you don't do the basic right.